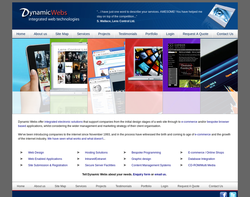 Web design and content management systems. 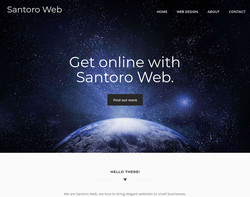 Web design, e-commerce, search marketing, web hosting. 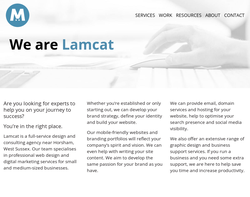 Graphic design, site design, redesign, site maintenance, hosting and domain registration. Website design, multimedia CD, and graphic design. 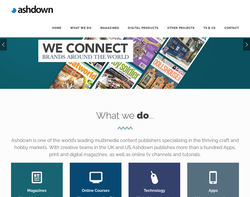 Web based solutions, magazines, i-magazines, media management, IPTV and film solutions. We are an IT Software development firm based in the UK and USA, with our 2 offshore development centers in India. Our expertise is in web publishing; we have more than 7 years of experience in this domain and as a result have catered to more than 100 clients in the Europe (mainly in the UK, Spain) and US / Canada and producing around 800 websites and systems. We currently have a large team of coders and designers, who can work on your projects with quick turnaround time. They can slice your design files, create html, css and xhtml pages, embed flash elements, redesign the website with custom designed Content Management System (CMS), SEO the portal, add a shopping cart and e-commerce functionality and do a whole lot of stuff� All for you at a very nominal cost! 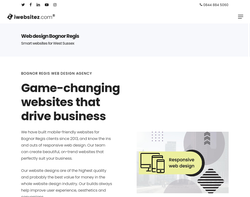 Just Web Design is a creative design agency offering bespoke website design, search engine optimisation, content management systems, e-commerce, web hosting and much more in Brighton and Burgess Hill Sussex. 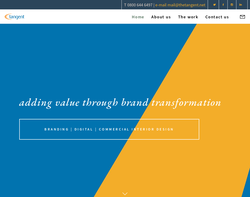 PixPerfect are industry professionals in combining website design, online marketing and sales copywriting techniques to deliver you an affordable website solution. 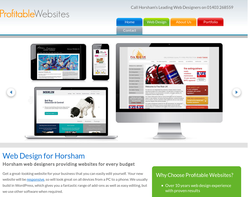 We specialise in website design and search engine optimisation (SEO). We create eye catching functional websites, that rank highly in search engines. From a one page web presence for a one man band to large content and feature rich sites for established companies.....and everything in-between. 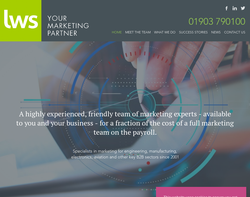 LWS Marketing are a custom & bespoke web design & marketing agency in West Sussex offering corporate photography, SEO, PPC, social media, email & digital marketing services for all marketing solutions. 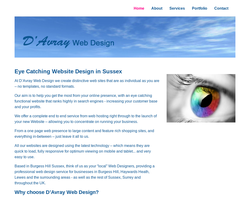 SPC Designs is a web design service based in Crawley, West Sussex. 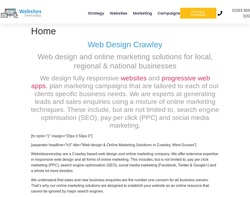 We specialise in website design, website development, search engine optimisation, social media optimisation, website hosting, custom graphics and online marketing. 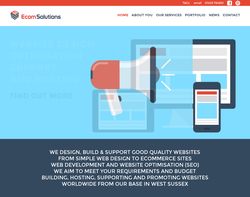 If you are looking for a web design company that can offer a one-stop solution to all your web development needs then look no further. All websites are built to be completely mobile phone and tablet friendly and will resize automatically. They are also fully editable by you with little or no programming skills. All new websites come with 1 year FREE hosting and also 1 year FREE support. We talk in plain English and will not confuse you with technical jargon ! 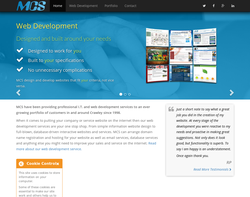 We will guide and advise you all the way through the web design process. Please take a look at a few samples of our work on our website and feel free to call us, drop us an email or chat to us online at any time. We offer fully responsive website design services, search engine optimisation, content marketing, pay per click services, display marketing and a full range of social media services. 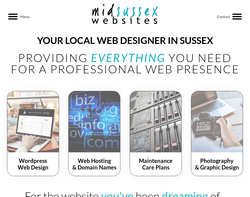 Professional Web Design in the heart of Mid Sussex We offer professional web design for small businesses & individuals, ensuring excellent value and fantastic looking websites for all. 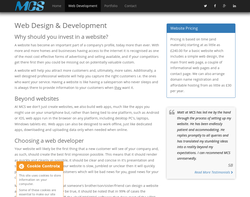 Dynamic and engaging websites to promote your products and/or services with style and functionality. 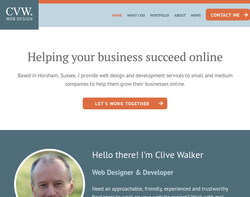 Standard Websites Perfect for small businesses and sole traders as well as individuals. 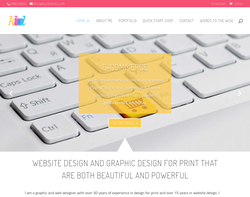 We aim to make contemporary websites that are attractive, affordable, professional, secure, informative, fresh, inviting, personal, profitable eCommerce Websites Your very own online store! Market and sell to customers near and far. Break free of geographical limitations, welcome new customers, lower costs, offer great deals, bargains, discounts to tempt online shoppers. Provide abundant information to the customer, more than you could ever hope to do without an online presence. Be open for business globally...24 hours a day! Websites 'Extras' We know one size does not fit all, especially with something as unique as your website. We are able to provide a multitude of additional features for your site to ensure you have the functionality you require. 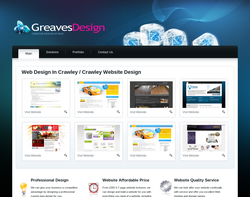 Greaves Design Ltd is a professional web design Horsham company. 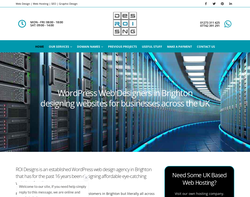 We can meet all your local website design needs from concept through to design, build and secure UK hosting. 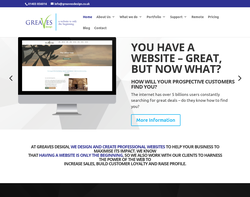 At Greaves Design, our focus is on helping your business to get online, then maximising the potential of the web to deliver you more visitors, more customers and ultimately higher profit margins. We know that having a great website is only the first step. In order to make it a wise investment, your website needs to raise your profile, attract visitors, and then turn them into sales or enquiries. 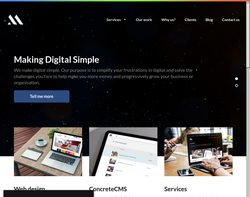 Whether you’re taking your first steps online, or you already have a web presence but want to get more from it, our services cover everything, from building a new website to managing your entire digital marketing strategy. We offer a service that’s entirely tailored to your needs and expansion plans, whether you’re a sole trader, an SME looking to expand, or an established industry leader. 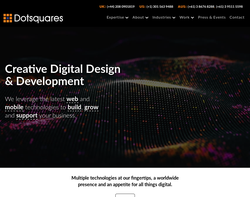 We offer up-to-date web design and development services, making sure we stay ahead of the curve but offer the best possible customer service. Our clients satisfaction is extremely important to us and we like to deliver the best results for very competitive prices. Website design WordPress websites and blogs ecommerce email marketing Hosting. Whether you're established or just starting out, we can help you with logo design, brand development and website design, as well as providing hosting for your website and email. We can also help to optimise your social media presence and tune up your Etsy shop. For those with larger ideas, or if you have an existing store you want to scale up, we can build you a fine-tuned Magento eCommerce solution.